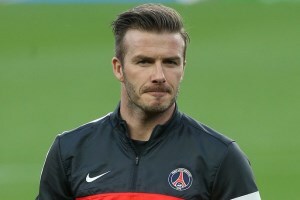 It has been revealed that Italian giants AC Milan have paid tribute to David Beckham after the PSG midfielder announced his retirement yesterday. The former England international played nearly 30 times for the Rossoneri between 2009 and 2010. A statement on the club’s official website read: “One of Milan’s most famous fans is hanging up his boots. David Beckham, who spent 2 half seasons with the red and black of Milan, will play no more. “An impeccable professional, he made his debut for the Rossoneri in January 2009 against Roma is a match that ended 2-2. He left the club in March 2010 with an Achilles tendon problem after the match against Chievo. “Always ready to sacrifice himself for the cause, Beckham on that evening got off the pitch as quick as he could to allow Milan to push forward and for Clarence Seedorf to score the game’s only goal. “His arrival at the club may have been greeted with some scepticism but his performances as a player quickly won over the non-believers. “Two goals against Genoa and Bologna as well as 29 appearances with AC Milan helped the team towards two Champions League qualifications.